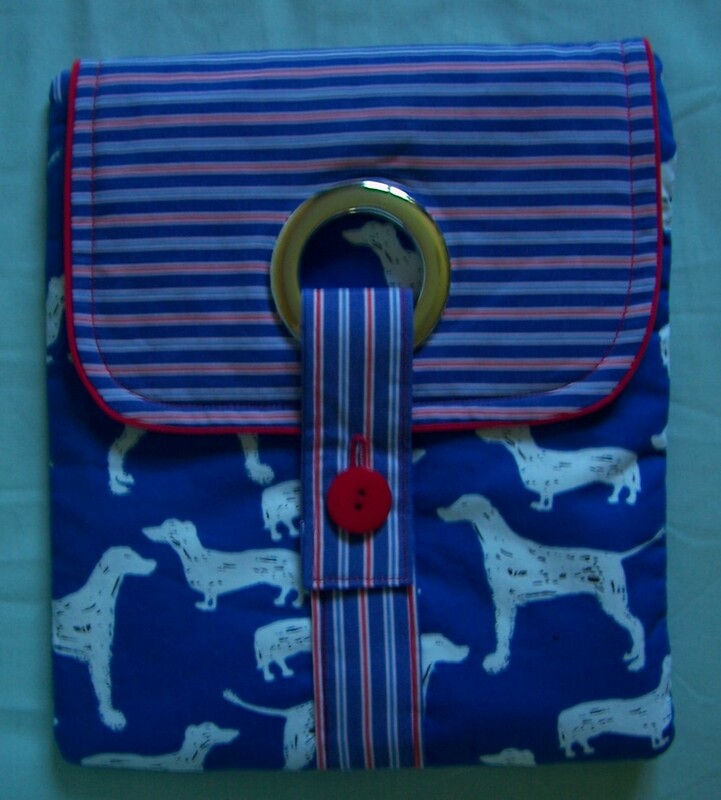 I woke up really early this morning and rather than snooze or surf the internet I decided to go into my sewing room and prepare for the next multi-purpose tech tablet bag. 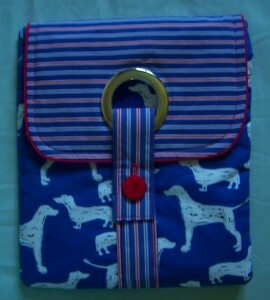 This time I would make it slightly smaller and without a strap simply to be used as a bag for my e-reader. 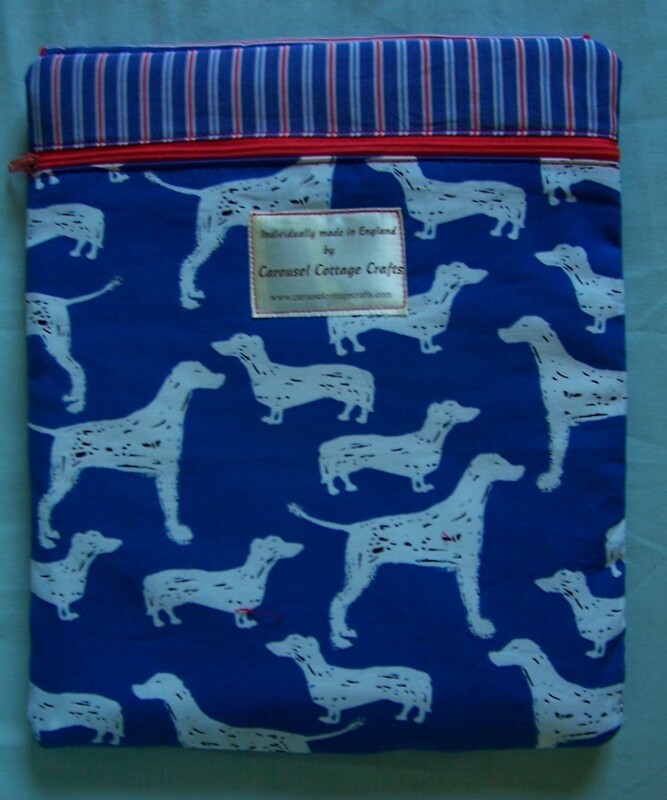 I used some more of the Blue & White dog print cotton from New Threads and co-ordinated with some recycled stripe cotton from one of my husband’s old pyjama jackets! 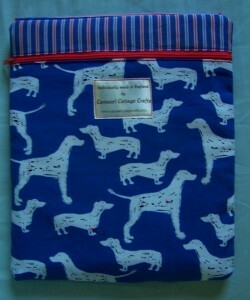 I unpicked the Red piping and used it around the bag flap to co-ordinate with the red zip, button and topstitching. In a little over 2 ½ hours I had not only prepared the fabrics but completed the entire project! By speeding through the construction I noticed that the fusible wadding was not thoroughly fused in all places. Next time I make this bag I will either use some pre-quilted fabric or will quilt the pattern pieces prior to construction. After our weekly sewing group meeting I visited New Threads and left this bag together with examples of the Cross Body Bag so that Ladies who sign up for the Workshop to be held in October will be able to see exactly what they will be making. Next on the list – prepare another Cross Body bag to take on holiday plus a Multi-purpose bag for my Sister’s birthday. The latter will have to feature chicken print somewhere in the construction!